As the summer months begin to dwindle down you may be wondering how will I make this school year better than the previous one? The answer isn’t straightforward. And cannot simply be found by changing your apple for lunch from a granny smith to a honey crisp. MicroK12 believes the first step into making sure this school year is the best one yet is by having the latest and greatest technology within the classroom. Not only does new technology enhance student’s willingness to learn but can also open-up teachers’ abilities to making more of an interactive and effective classroom. Get tech in your students’ hands: Whether that’s through a laptop, tablet or interactive whiteboard, they’ll feel much more interested in working on a lesson requiring the use of touch-screen capabilities and the exploration of online tools and apps. Scope out the essential tools to make sure your tech is running smoothly: No one likes to begin the day with their devices not performing to the best of their ability. Almost all technology nowadays offers helpful tools to allow for little to no error, so you’ll feel ready as ever to begin each day. Use new tools to do new things: If last school years technology wasn’t driving results – switch it up and see what else is out there. Summer is a great opportunity to see new features for classroom devices and how teachers can incorporate them for their own unique learning style. Allow for students voices to be heard: This doesn’t mean students should be shouting from every angle of the classroom. Have them feel comfortable using technology as resource for communication. Not only will this open-up students’ ways to converse with teachers but could also make them feel more confident as writers. Hop on the STEM bandwagon: Everyone is doing it, so why not join them. STEM is vital for our young students to learn. Who knows, the future could be controlled by robots. MicroK12 offers a wide variety of STEM Solutions that will meet your futuristic classroom needs. Be organized: There are plenty of organization tools on the market that can enhance classroom management. Always have a backup plan: We cannot predict when technology will fail us, and there isn’t always an easy fix. Be prepared by having a backup plan when the time comes. We’d suggest having extra paper copies of assignments/lessons available and all items stored to a cloud-based software, so students can access items later if need be. 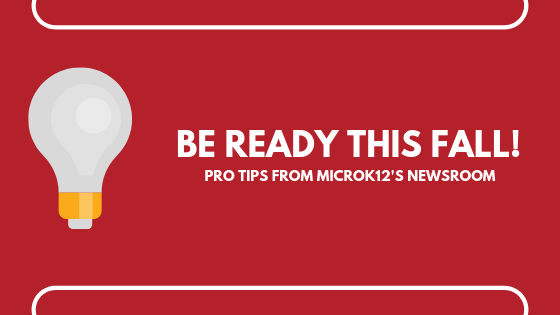 Be prepared for the school year ahead, with tips from MicroK12 you’ll feel confident and ready to mold your students minds with amazing new technology. Next PostNext Google Creative Apps for Education – Why these apps will transform the classroom.